As Christians, we believe that “through Baptism, the Christian has already ‘died with Christ’ sacramentally, in order to live a new life; and if we died in Christ’s grace, physical death completes this ‘dying with Christ’ and so completes our incorporation into him in his redeeming act…” (Catechism of the Catholic Church, 1010). At the difficult time when a loved one dies, we call to mind how our Baptism binds us with Christ and with each other – all the living and deceased – through the Communion of the Saints, and the hope of eternal life when all will be reunited in God’s heavenly kingdom. We all know that we and our loved ones can die at any time, and the church is here to walk with the grieving every step of the journey. In my years of pastoring, I have noticed that when families have a loss, they may be unsure when to contact the church, and I hope to clear up and answer any questions with this article, and with an excerpt from Facing Death Together, Parish Funerals, by Margaret Smith, SGS. When there is a loss, I often learn when a family member contacts me or when a funeral director calls me. Funeral directors coordinate with the parish for the availability of a priest and day for the funeral. For a cemetery plot in St. Joseph Catholic Cemetery (our parish cemetery), families are asked to purchase a grave site by coming to the St. Paul Parish Office and making the check out to “St. Joseph Cemetery,” per the guidelines of our Diocese, which adheres to the State of Illinois regulations. The funeral director will discuss options with families who seek burial in cemeteries other than our parish cemetery. After meeting with a funeral director, a time will be arranged for family members to meet with the parish bereavement-consolation team members to talk about possible liturgical ministers for the mass, to review songs and scriptures, and to share their memories of their loved one. This initial meeting enables me and the entire parish to fully offer families three meaningful rituals of the Order of Christian Funerals: The Vigil Prayer service, the Funeral Mass, and the Rite of Committal. These rituals help with the grieving process. 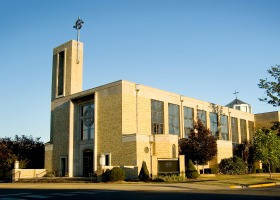 A funeral luncheon is often offered at the Knights of Columbus Hall, although some families may choose another venue. The funeral director will coordinate with families who wish to arrange a luncheon. "Who offers what at the death of a Christian? The OCF (Order of Christian Funerals) is very clear that when a Christian dies, the church, the believing community, offers a ministry to the mourners and to the deceased and that such a ministry finds its source in the event of baptism: “Those who are baptized into Christ and nourished at the same table of the Lord are responsible for one another” (OCF, 8). The believing community is the body of Christ that when “one member suffers in the body…all the members suffer with that member” (OCF, 8). It is because of this oneness in Christ, and of the deceased’s life in Christ, that the responsibility for consolation cannot be an option for the community of faith. It is the church’s responsibility to comfort and console the mourners and to be with them in prayer as they mourn for their loved one and as they complete their care for the deceased. Throughout this ministry the church professes its belief in the paschal mystery and announces that in death, while life as we know it is ended, the deceased now enjoys a life that has defeated death, a life that continues beyond the grave. This is the thrust of the church’s ministry at the death of a Christian. The service of the funeral director does not necessarily find its source in baptism, nor in oneness in the body of Christ. The funeral industry is involved in the business of assisting mourners in all that needs to be done, in order that the body of the deceased be laid to rest in a manner that is respectful and dignified. Their primary service, although this is by no means the only one, lies in the preparation and transfer of the body of the deceased. This work of the funeral profession is very focused and clearly very different from the work that is rightly the church’s in the face of death. Again, please know your St. Paul Parish family is here for you during times of loss, and I encourage you to contact the parish office if you have any questions about a Catholic funeral or a plot in our cemetery. Thank you.